by Michelle Hunter, 2nd year student, MPhil Textile Conservation. In June I had the opportunity to attend the Institute of Conservation (ICON) third triennial conference in Birmingham, United Kingdom. ICON is the professional body for the conservation of cultural heritage in the United Kingdom. The triennial conference was an opportunity for members of all conservation specialties to gather to exchange, showcase, and share ideas and experiences. Over two days a wide range of papers were presented under the theme of Turn and Face the Change: Conservation in the 21st Century. Textile sessions were held on the first day showcased eight speakers from the United Kingdom, United States, and Australia. We heard about the collaborative approach of conserving feather hats at National Museums Scotland, the preservation dilemmas of fashion items constructed from modern materials held within the Costume Institute and the Brooklyn Costume collection at the Metropolitan Museum of Art, and how chemical and historical research can be combined to create a deeper understanding of the composition of early synthetic textile dyes. ICON Scotland group sessions were held on the second day. This was the first subgroup session held by the Scotland group. These sessions were unique as they showcased a range of conservation specialities with the common thread of Scotland. The Scotland subgroup had their own theme of ‘we can be (conservation) heroes’: demonstrating flexibility, innovation, and collaboration. Some of the presentations included the collaborative efforts of Glasgow Museums to document and rehouse a number of banners that showcase the City of Glasgow’s social conscience and a call to revaluate our professional language and ways in which we speak about conservation. We were encouraged to abandon the word ‘painstaking’ when referring to delicate and intricate conservation treatments. I for one promise to never use that word again! As part of the ICON Scotland group I had the opportunity to present the results of a collaborative project between two Scottish intuitions, Glasgow Museums and the University of Glasgow Centre for Textile Conservation. Earlier this academic year, the second year textile conservation students teamed up with Glasgow Museums to monitor the impact of open display on historic costume during A Century of Style: Costume and Colour 1800-1899. The project focused on utilizing a low cost method of measuring and quantifying dust and provided recommendations for future open display of historic costume for Glasgow Museums. The conference was fantastic opportunity to showcase a collaborative project between two Scottish institutions and promote the benefits of students and institutions working together. 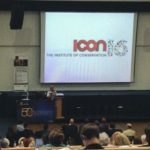 Attending the ICON conference was a fantastic experience to hear first hand the issues conservators are currently facing and to meet with other conservators form all over the United Kingdom and abroad. Being a student conservator training in Scotland I most enjoyed the Scotland group sessions. I thought these sessions were a unique way of shining the spotlight on some of the conservation projects that are taking place in Scotland to a wider audience. I am looking forward to seeing what the next conference will bring. I would like the thank ICON Scotland group and The June Baker Trust for providing funding to attend the conference.